Who can help with my t-shirt graphic design? Retro Shirtz is a locally-owned small business, born and raised in Omaha, Nebraska. The store started out as a small print shop in a laid-back corner of a small Ralston strip mall. It grew into full-fledged shirt printing business which churns out tens-of-thousands of shirts each year. We are also very proud to consistently break Westroads Mall sales records for local businesses. We were founded by two guys who have spent their whole lives living in Nebraska. Andy went to Columbian, Burke, and UNO, and specialized in retail management and sales. Brad went to Columbian, Prep, and UNL, while specializing in graphic & web design and restaurant management. They took their diverse backgrounds and turned it into something entirely new. A quick-service same-day custom shirt print shop and graphic design studio. A place where a customer can have a shirt idea and then have a finished printed shirt the same day. We are very strict about hiring our staff, and every last staff member has been personally trained by the store owners. Retro Shirtz starts with great people who are fun, smart and artistic. We then hone their graphic design skills, while fostering an atmosphere of learning and development. Our staff is like a big family. We have fun and work hard. And we’ll make sure to give you one of the best customer service experiences you have ever had. Come in and check us out. You won’t be disappointed. Some businesses say the customer is always right. We believe the customer should always be treated right. That means taking care of you, listening to your needs, and helping you however we can. Our print shop has a high attention to detail, promotes high quality, provides quick service, and produces high quality t-shirts and apparel. We take pride in our work, because we’ve trained, practiced, and refined until we got it right. We value your feedback and take both compliments and criticism. And we get better from both. Please contact us, we’d be happy to hear from you. The staff works with the philosophy that every order, whether one shirt or 1,000 should be printed with care. Our store’s policy is immediate rejection of any apparel or prints that are less than perfect. If you ever the slightest bit dissatisfied with your apparel, let us know. We will try our best to make it right. Our print shop uses garment printers. These t-shirt printing machines print in full color, can print a single shirt in minutes, and allow our customers to have no minimum orders. You can even order a single shirt. Retro Shirtz doesn’t have any setup fees, because we use machines. Older manual processes, like screen printing, takes time to set up – and that time comes with setup fees. Our store’s print shop will make you a cool design, load the shirts on our machines, and press print. Easy as that. And because we save time and money by not having any setup, we pass those savings onto you. We do not charge for extra colors in your t-shirt design. You can have a shirt with a single color, several colors, or even full photo color. They are all the same price. All of our shirt prices include the custom t-shirt, the graphic design, and the printing process. There are no hidden fees. Fast, efficient, and high quality. That’s us. 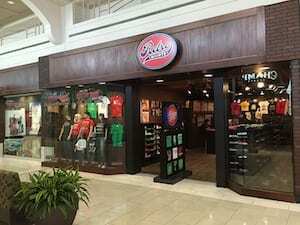 Where to get custom shirts in Omaha – Retro Shirtz at the Mall! Retro Shirtz is located on the second floor of Westroads Mall in Omaha, Nebraska. We have a full store-front which contains out graphic design studio, as well as our pre-made graphic t-shirts for sale. Our studio is two doors down from the newly opened Flagship Commons Food Court, directly across from Champ’s Shoe store. Please see our location page for a map and directions. What questions do you have about custom shirt printing? Check our t-shirt prices page or contact us. Feel free to stop by our Westroads Mall location – no appointment needed. Hours of operation. Read about our graphic design process. It’s included in the price. You picked the right place. Help, I need my shirts printed in 15 minutes! Ahhhh!!! We’ve got you covered. Our phone number is 402-614-0888 or look at our same day shirt printing. Come in ASAP and get your order started! I need full color printing, photo printing and/or garment printing. Here’s info on t-shirt printing. Our store has no minimums, full color printing, and the newest state-of-the-art shirt printing machinery. We need need cool matching shirts for our next beach vacation! We recommend our bulk shirts for friends & family, SPF 30, and cold beverages with little fruit slices. As always, your design is included!